Some of you may not know that I am an indie artist on Minted.com. Minted holds various art and design challenges where voters in the Minted Community rate the best pieces in a highly competitive process. I submitted my artwork to the Make a Statement Large Format Art Challenge. My artwork, "Somewhere" was among 5500+ submissions from artists all over the world! I was so completely honored that my piece was selected among the winning pieces! 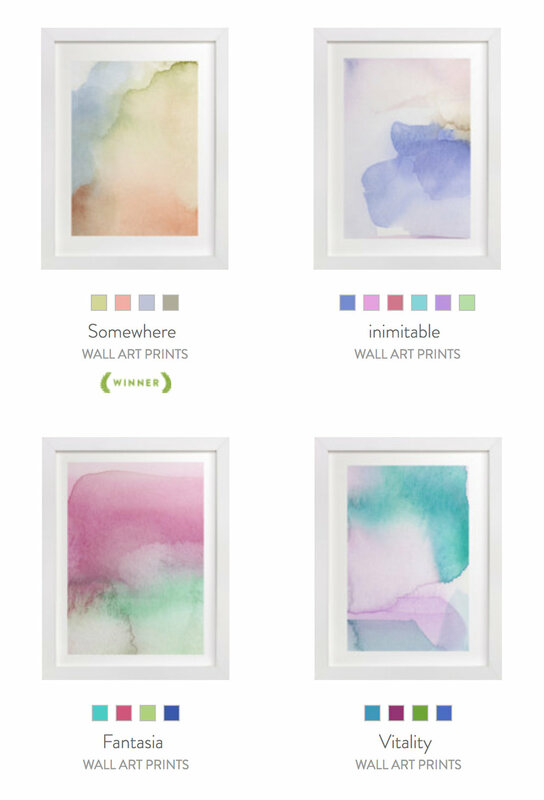 It is the first piece in my newest collection -- a watercolor wash series, available now in my Minted shop. The collection consists of four different prints available in a variety of color options. I am also in the process of a beach-inspired collection that will be available later in July. These two collections will be the last of my abstract art pieces as I begin to transition into portrait and figurative artwork. Also, if you're interested in signing up for 21 SECRETS SUMMER STUDIO: Just Add Water art journaling program, there's still time! Registration ends July 8th! Hope to see you in class!